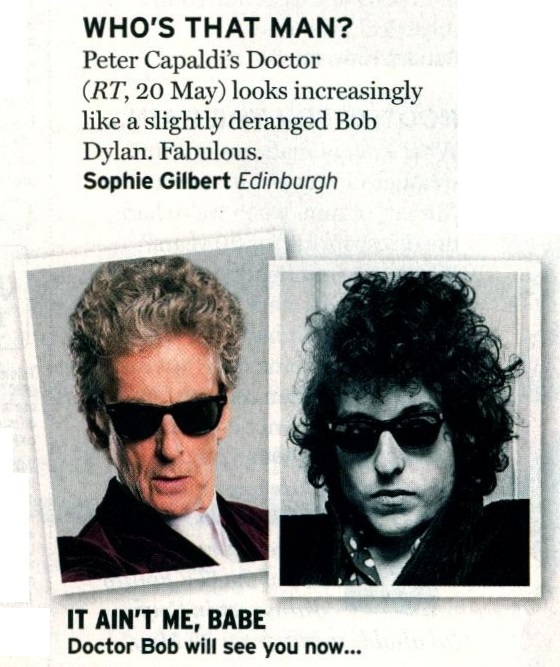 Peter Capaldi's Doctor (RT, 20 May) looks increasingly like a slightly deranged Bob Dylan. Fabulous. APA 6th ed. : (2017-05-27). Who's That Man?. Radio Times p. 151. MLA 7th ed. : "Who's That Man?." Radio Times [add city] 2017-05-27, 151. Print. Turabian: "Who's That Man?." Radio Times, 2017-05-27, section, 151 edition. This page was last modified on 25 December 2018, at 17:05.